An exciting holiday adventure awaits you on this six-day tour in Cape Town, recently voted the world’s premier culinary travel destination. Aside from its breathtaking scenic beauty and bio-diversity, Cape Town features a host of indoor and outdoor activities that lend themselves to culinary adventures. Discover why Cape Town and the Garden Route is regarded as one of the most beautiful, delicious destinations in the world. Join in with African Destinations Travel and get to know the cultural as well as culinary secrets of the city. During this holiday, you will stay at 4 Star Tsogo	Sun	Hotel or Hilton Cape Town Bed & Breakfast in shared occupancy. If the accommodation at this hotel is not available on your preferred dates, African Destinations Travel reserves the right to seek alternative accommodation but with the same quality. You will be arriving in Cape Town. Meet and greet at Cape Town International Airport for transfer to the hotel. There will be time allowing you a short tour of Camp’s Bay and Atlantic Seaboard. You will enjoy dinner at the Harbour House Restaurant Waterfront. Breakfast will be served at the hotel at 8:00 a.m. Then you will be picked up for the Peninsula tour at 9:00 a.m. You will be going for full peninsula tour including False Bay, Muizenberg (shark spotters), Simon’s Town, Boulders (penguins), Cape of	Good Hope and Cape Point, Chapman’s Peak Drive and Hout Bay. You will be having lunch at Cape Point. You will then return to the city late afternoon and freshen up at the hotel. Afterwards, you will be picked up for dinner at 7:00 p.m. You will return to the hotel afterwards. Breakfast will be served at the hotel at 8:00 a.m. Then, you will be picked up for tour at 9:00 a.m. You travel to the Franschoek valley for a wine tasting tour in this historic region and enjoy lunch on one of the estates. 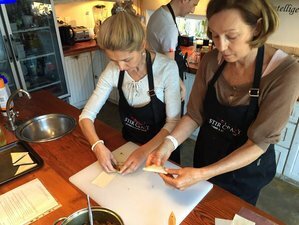 Your afternoon is set aside for a cookery class in lovely Hout Bay with a South African meal, including a mix of local flavors from Cape Malay to authentic African and South African. You return to the hotel after dinner. Breakfast will be served at the hotel at 8:00 a.m and then check out for the tour. There is a pick up at 9:00 a.m. for Table Mountain and city tour. After the visit to Table Mountain you stop in the colorful Cape Malay area of Bo-Kaap. There you explore the rich culture and a traditional Malay meal of fruity, mild and fullbodied flavors. If there is time, you would go for a walking tour of the inner city. Airport transfer will be provided at 4.00 p.m. and finally you will depart at 5:00 p.m.
African Destinations Travel	have made use of all available time. You can	make adjustments to allow free time for relaxation	or shopping. All tours are private and personal, this allows you flexibility to adjust the tour to your needs, stopping perhaps a little longer in some places	and moving on where you prefer. Some activities may be weather dependent, which could mean	changing	the itinerary to accommodate	this. You could decide to include any options as listed, or otherwise you will need to adjust the itinerary accordingly. Additional charges will be levied where needed. This tour will take place in Cape Town, South Africa. Every day during this holiday, you will be served with daily breakfast. Lunch and dinner will be served as per the itinerary including half bottle per person of select Cape wine with dinner. In addition, bottled water will be supplied on tours in the vehicle. please book your flights to Cape Town International Airport (CPT). Transfers are included in the price. Airport: Cape Town International Airport Airport transfer included: Cape Town International Airport No additional charges. You can request this in the next step. African Destinations Travel offer tours and travel packages. We know how important your holiday is and we make sure it is filled with wonderful memories. Please send an inquiry to African Destinations Travel for the availability and pricing details of the single occupancy accommodations. Rates are subject to change without prior notice for increases beyond African Destinations Travel's control. These may include fuel increases, entry fees, etc.